The fruit, vegetable and crop plants we grow in order to feed the nation depend on a regular supply of water to maintain their health and vigor, and produce maximal yields. Food plants have always required water, and for millennia humans have supplemented natural supplies through mechanical intervention such as the Archimedes screw, artesian wells and the daily trek to the river with calabash and bucket. The food plants we grow can almost be said to have co-evolved with the greater technical efficiencies that have emerged for the provision of water by means of irrigation. 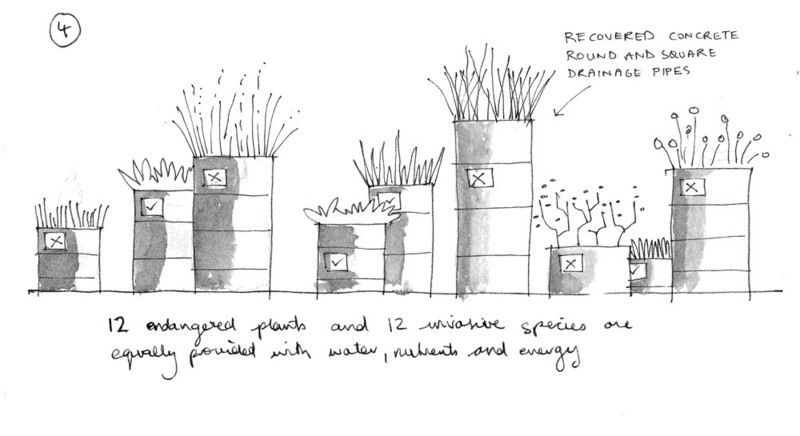 We developed six proposals for the St Louis Science Center Agriculture Center Plant Biology installation. 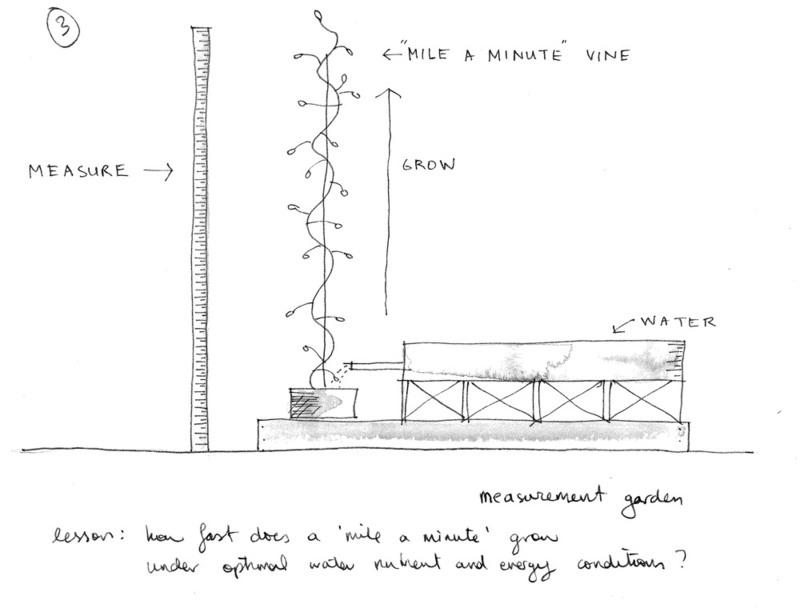 These proposals investigate the role of irrigation in the performance of plants, and at the same time gently unpick our assumptions about the balance of nature. Four apple trees are suspended above a one foot deep pool with carp swimming in it. The trees’ roots are bare. 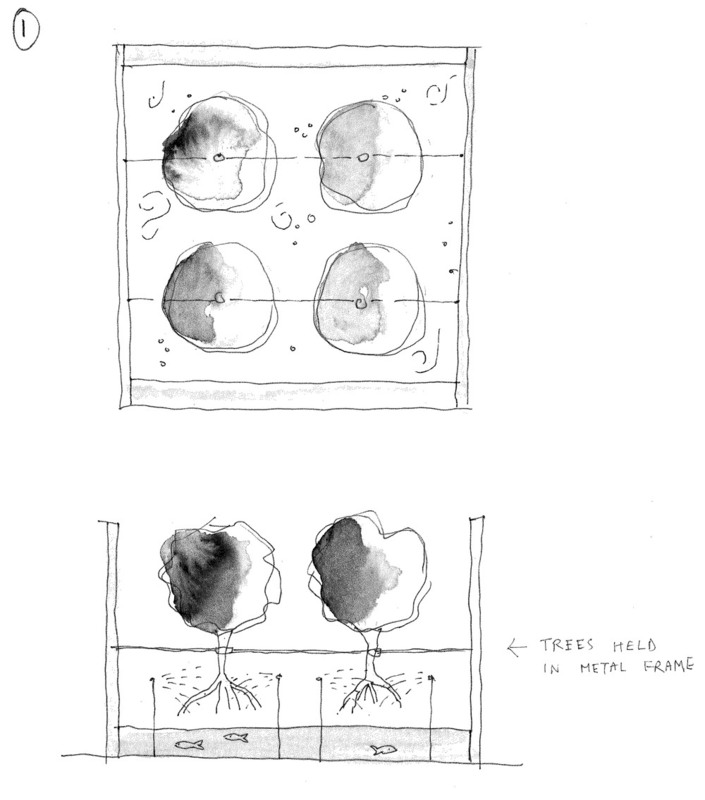 The only way they receive nutrients is through emitters that stand above the level of the water and spray the roots with fluid at regular intervals timed by a computer. The trees grow well, the fish receive nutrients in the run-off as a side-effect, and visitors can observe the tiny hairs on the tree roots doing their work. Perhaps a live cam aimed the root hairs can magnify them on a screen. This installation addresses the problem of the balance of nature, suggesting that perhaps natural systems are in fact far from equilibrium, in negotiation, interminably. The two major classes of natural things are biotic and geologic, and they are always in interaction. For instance, if a small bird alights on the rock, a recalibration occurs. When it flies away, the balance swings again. Kudzu vine, introduced into the southern United States as a fodder crop during the dustbowl years, grew so fast in the mild climate of the south that it was considered a wonder crop. But the tables turned on kudzu and it is now a number one pest. The kudzu doesn’t care. As far is it is concerned speed is all. This device measures it to see if it can indeed, as once touted, grow a “mile a minute.” Pour on that water folks. Ruderal species are those that are the first to colonize disturbed sites. They are adapted to have less need for water, but they mostly are considered “invasive species.” This installation pairs twelve endangered species and twelve “weeds”, all planted in concrete sewer and drainage pipes, to see which survive best without water. The pipes with the checks on them are endangered species; those with the crosses are invasive species - they are identified in this way so observers can tell which is which. Reticulating water flows with great abundance through a series of pipes, pools and drums, spilling over on to the ground and into pools. None of the water seems to get to the vegetable and fruit plants that are distributed through the site. Instead it enters a subsurface tank, to begin its pointless, but joyous, journey again. The installation draws attention to problems associated with the human management of water resources. A large fruit tree is placed in a tub atop a water tank stand (the water tank has been removed). 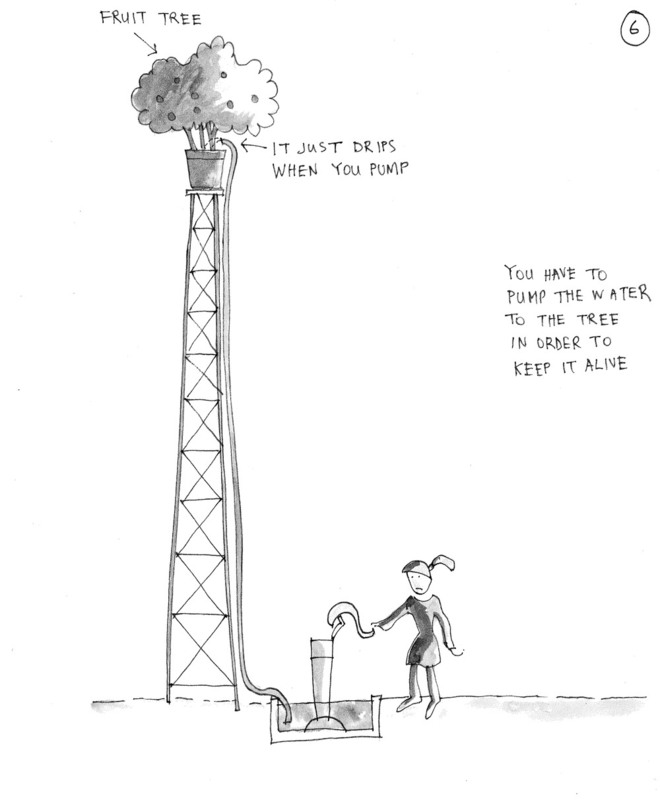 In order to supply the tree with the water that it needs to grow and bear fruit, a hand pump has to be operated almost continuously. Because of the enormous vertical distance the water has to travel, it only drips from the end of hose. Just enough to keep it going if the pump is operated assiduously by members of the public.